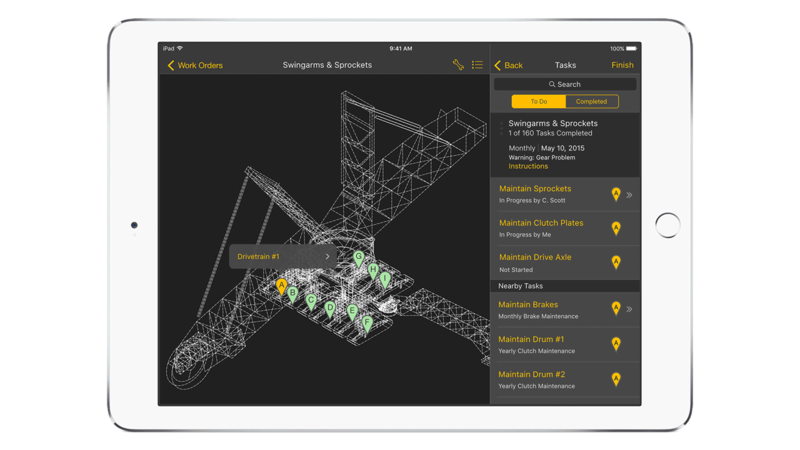 IBM MobileFirst for iOS Asset Care employs advanced analytics to help maintenance technicians better service heavy equipment in the field. Using the app maintenance technicians in the field have the information they need at their fingertips to streamline processes and communication. The app also helps them make smarter decisions faster with tools for visualizing work orders using asset schematics to sort and prioritize maintenance. Device tap in/tap out notifications indicate which equipment is being serviced and when for better collaboration, and FaceTime enables face-to-face communication with colleagues. The Asset Care energy and utilities iOS app is designed to help maintenance technicians capture real-time information from the field and use advanced analytics to inform asset maintenance decisions. The app records operational analysis and rich inspection data ─ including pictures and video ─ to optimize work orders, run sheets and workflows, and analyze the location of heavy equipment in the field to ensure work is completed efficiently and correctly. The app can monitor for asset damage, wear or other concerns and send that information to planners in real time so repairs can be scheduled before more damage occurs or the asset fails. With this data in hand, technicians always have the right support equipment and machinery in place to complete maintenance work more efficiently. The app also provides daily and weekly views so technicians can plan maintenance work to foster independence and accountability. Enable safe and efficient inspections and maintenance. Improve collaboration, productivity, situational awareness and safety.